Mobile becomes your remote control. The most powerful and most complete! Compatible with all automatic door systems. - 4 alarm inputs to warn you. 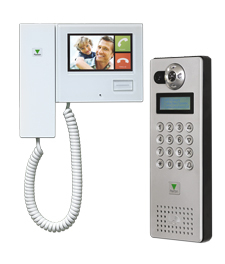 A reliable and secure remote control. ideal for professional and residential use. You have a gate at the entrance of your property and a garage door. When you call the Musitel unit, gate and garage open. When your children call, only the gate at the entrance opens. Automatically after a few seconds the door will close (max. 4 minutes and 15 seconds). Example : With your radio remote, you must close the door by a second press of the button. Musitel 622 can automate this. You can rest assured that the door is closed. Useful if you open the door remotely, without visual inspection. Net2 Entry is the simplest door entry system available, comprising just three components that offer a true plug and play solution.